No. 28 seed Denis Shapovalov advanced to the second round of the US Open as his opponent and fellow Canadian Fellix Auger-Aliassime was forced to retire from the match in the third round. Shapovalov took the first set 7-5 but Auger-Aliassime responded in the second taking it 7-5 as well. In the third set Shapovalov looked to be in control leading 3-1 before Auger-Aliassime had to take a medical time out. Play resumed in which Shapovalov took a 4-1 lead, but the 18-year-old Canadian couldn't continue and the match was called. ESPN is reporting it was an irregular heartbeat, something that he's been dealing with as his heart rate starts to pick up and flutters. He was dealing with dizziness and a faint feeling. Their combined age made this the youngest U.S. Open men's match since 2006, when Novak Djokovic, 19, beat Donald Young, 17. 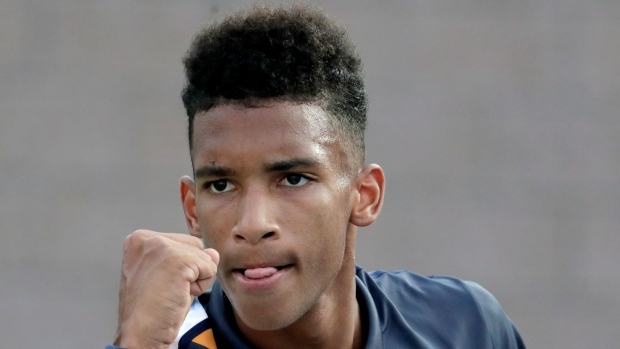 Auger-Aliassime just turned 18 on Aug. 8, making him youngest player in the ATP top 200.